Over the next 30 years, baby boomers will transfer an estimated $30 trillion in wealth to their children. Unfortunately, studies show that most Americans are not prepared. In fact, a recent LexisNexis survey showed that 55 percent of Americans don’t have an estate plan or even a will. We all have our reasons for delaying conversations. However, the risks of not having a plan in place are high. I have seen cases where the impact to the family has not only been costly financially, it has also added real stress to all those involved. But estate planning should be about more than just money. It’s about passing down your values, and ensuring continuity among the generations. Inheriting a legacy comes with certain consequences and responsibilities and the more advance planning you do, the smoother the transition. There are five steps that can be taken to begin this process. Prepare your children by instilling values at an early age. When they’re young, give them an allowance and teach them about spending, saving and investing. Set aside a stipend they can use to make donations to charities of their choice, and have them present to the family why they chose the organizations. When they’re in high school, discuss their inheritance and the importance of long- and short-term goal setting. Introduce them to your financial advisers to further their understanding of wealth concepts and to become comfortable working with experts. When children are adequately prepared, they become good stewards of your legacy. Lack of communication and trust can account for most estate transfer failures. Ensure open dialogue and shared decision-making about your legacy. Foster a family culture of achievement and independence that celebrates successes. This will help your children develop a healthy attitude toward money that will serve them well throughout their lives. In the case of a family business, it’s important to clarify your successors’ roles. Don’t assume they will want to take on the business. Establish a clear plan of what happens when, and what happens to family members who may be owners without being managers. The earlier you plan and communicate, the easier it is to avoid or address potential conflicts. Schedule a family meeting to discuss your visions for the future and review documents. If you have a plan in place, make sure everyone is aware of it and comfortable with the details. If not, use your family meeting to start a conversation about the future. If your estate plan includes the standard health, education, maintenance, and support language and you want to set aside funds for other activities, make sure your plan specifies those activities. For example, you may wish to set aside funds to support your heirs’ entrepreneurial efforts, which are not covered by the HEMS language. And don’t forget to let heirs know the location of important financial and legal documents. In a paperless world, this includes designating an alternate that can access your account information. One of the most contentious aspects of settling estates is the division of personal property and heirlooms. Such items may not have great monetary value, but often hold significant sentimental value. You can prevent a lot of misunderstandings by having frank conversations about your heirs’ preferences for your possessions. Here again, open dialogue can prevent misunderstanding later on. Generational planning can be complicated. Once you’ve had the initial conversations with your children, work with a lawyer, estate planner, or wealth strategist to help you formalize your plan. A wealth strategist can review gifting plans and their tax benefits to ensure you transfer the maximum of your estate to your heirs permitted by law. It may take some effort, but once you have your plan in place, you can take comfort in knowing that the legacy you worked so hard to build will be secure in the hands of the next generation. 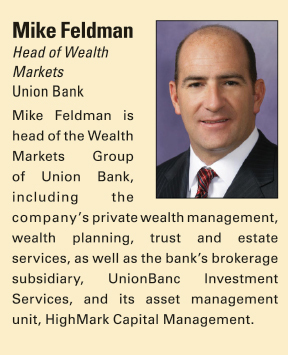 • Mike Feldman is head of wealth markets at Union Bank. The Private Bank is an exclusive part of MUFG Union Bank, N.A.